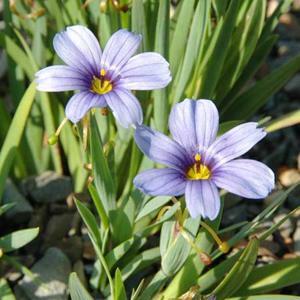 Dwarf, clump-forming semi-evergreen perennial developing fans of narrow sword-shaped leaves. Relatively large, satiny light blue flowers with yellow eyes, throughout summer. Sterile, does not set seed. Well drained, poor to moderately fertile, neutral or slightly alkaline soil in full sun. Dislikes excessive winter wet.